A complete list of Fan-Gang Zeng’s publications and their citation information can be found on Google Scholar. 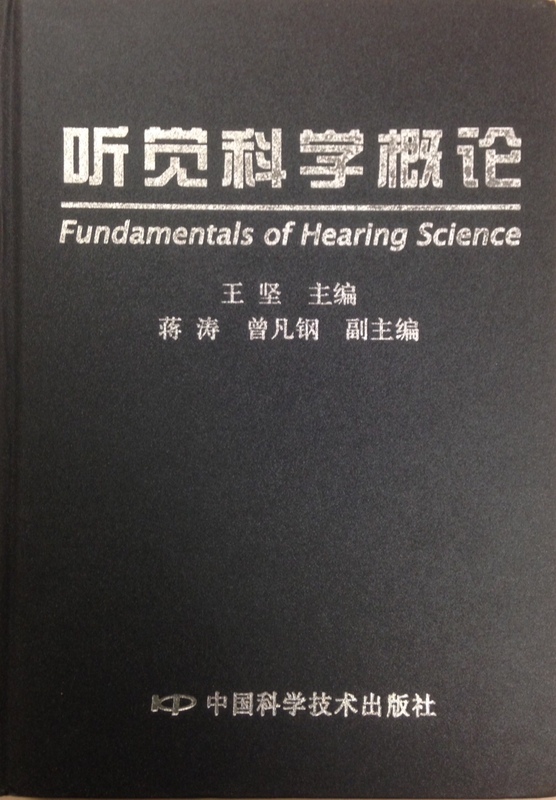 Recognizing the journey and celebrating the achievement of cochlear implants, edited by Fan-Gang Zeng and Barbara Canlon for the Lasker Award Special Issue of Hearing Research Volume 322, Pages 1-242 (April 2015). 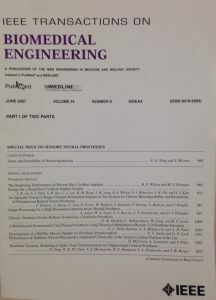 Sense and Sensibility in Neuroengineering, edited by Fan-Gang Zeng and Silvestro Micera for IEEE Transactions on Biomedical Engineering. The 18 papers in this special issue focus on sensory neural prostheses and their enabling technologies. 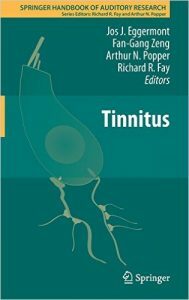 Tinnitus (Springer Handbook of Auditory Research Volume 44). Editors: Eggermont, J.J., Zeng, F.-G., Popper, A., Fay, R.R. Focuses on neural mechanisms of tinnitus and its behavioral consequences. 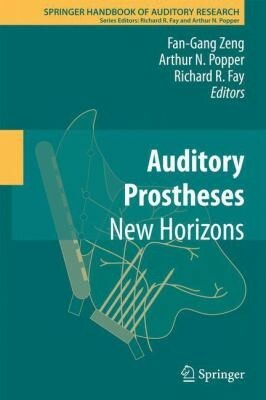 Auditory Prostheses: New Horizon (Springer Handbook of Auditory Research Volume 39). 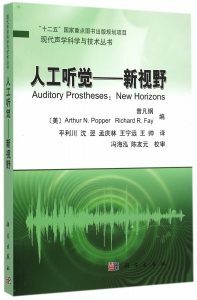 Editors: Zeng, F.-G., Popper, A., Fay, R.R. 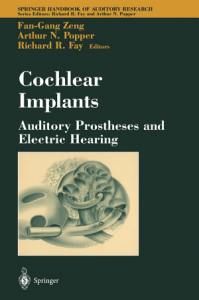 Cochlear Implants (Springer Handbook of Auditory Research Volume 20). Editors: Zeng, F.-G., Popper, A., Fay, R.R. Zeng, F.-G. and H. Djalilian (2010). “Hearing impairment.” PLACK, C. The Oxford Handbook of Auditory Science. New York: Oxford 3: 325-348. (2010 Zeng Djalilian.pdf). Altération auditive: A French version of this paper is also available (2010 Zeng Djalilian French.pdf). Zeng, F.-G. (2010). “The Best of 2009: Cochlear Implants.” The Hearing Journal 63(6): 38-40. Reavis, K. M., J. E. Chang and F.-G. Zeng (2010). “Patterned sound therapy for the treatment of tinnitus.” The Hearing Journal 63(11): 21-22. Yu, M., J. Xin, Y. Qi, H.-I. Yang and F.-G. Zeng (2009). “A non locally weighted soft-constrained natural gradient algorithm and blind separation of strongly reverberant speech mixtures.” IEEE 2009 Conference Record of the Forty-Third Asilomar Conference on Signals, Systems and Computers. 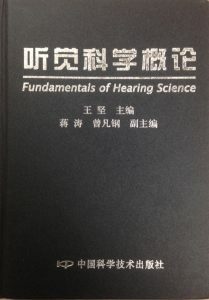 Xin, J., M. Yu, Y. Qi, H.-I. Yang and F.-G. Zeng (2009). “A non locally weighted soft-constrained natural gradient algorithm for blind separation of reverberant speech.” IEEE Workshop on Applications of Signal Processing to Audio and Acoustics, WASPAA’09. Zeng, F.-G., S. Rebscher, W. V. Harrison, X. Sun and H. Feng (2009). Cochlear implants. Implantable Neural Prostheses 1, Springer US: 85-116. Wu, J., W. Feng, W. C. Tang and F.-G. Zeng (2006). “A microsystem with varying-length electrode arrays for auditory nerve prostheses.” IEEE Engineering in Medicine and Biology Society and the 28th Annual International Conference of the IEEE-EMBS. Shannon, R. V., Q.-J. Fu, F.-G. Zeng and J. Wygonski (2006). “Prosthetic Hearing: Implications for Pattern Recognition in Speech.” Listening to Speech: An Auditory Perspective: 289. Zeng, F.-G., K. Nie, G. Stickney and Y.-Y. Kong (2005). Auditory perception with slowly-varying amplitude and frequency modulations. 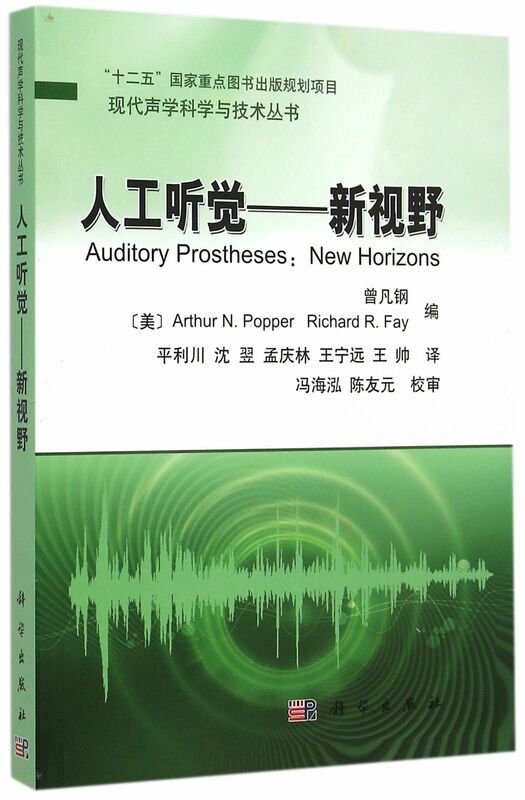 Auditory Signal Processing (Eds: D Pressnitzer; A de Cheveigne; S McAdams; L Collet), Springer New York: 282-290. Wu, J., W. Tang and F. Zeng (2005). “A high-density micromachined electrode array for auditory nerve implants.” Proc. Summer Bioeng. Conf: 22-26. Wu, J., L. Yan, H. Xu, W. C. Tang and F.-G. Zeng (2005). “A curvature-controlled 3D micro-electrode array for cochlear implants.” IEEE on Solid-State Sensors, Actuators and Microsystems, 2005. The 13th International Conference on TRANSDUCERS’05. Wu, J., L. Yan, W. C. Tang and F.-G. Zeng (2005). “Micro machined electrode arrays with form-fitting profile for auditory nerve prostheses.” IEEE Engineering in Medicine and Biology Society and the 27th Annual International Conference of the IEEE-EMBS 2005. Zeng, F.-G. (2004). Compression and cochlear implants. Compression: From cochlea to cochlear Implants (Eds by SP Bacon, RR Fay and AN Popper), Springer New York: 184-220. Zeng, F.-G. (2004). Auditory prostheses: past, present, and future. Cochlear implants: Auditory prostheses and electric hearing (Eds by FG Zeng, AN Popper and RR Fay), Springer New York: 1-13. Nie, K. and F.-G. Zeng (2004). “Using neural network and principal component analysis to study vowel recognition with temporal envelope cues.” IEMBS’04 and 26th Annual International Conference of the IEEE Engineering in Medicine and Biology Society. Nie, K. and F.-G. Zeng (2004). “A perception-based processing strategy for cochlear implants and speech coding.” IEMBS’04 and 26th Annual International Conference of the IEEE Engineering in Medicine and Biology Society. Xu, T., M. Bachman, F.-G. Zeng and G.-P. Li (2003). Polymeric micro-cantilever acoustic sensor array. TRANSDUCERS, Solid-State Sensors, Actuators and Microsystems, 12th International Conference on, 2003, IEEE. Liu, J., A. M. Shkel, K. Niel and F.-G. Zeng (2003). System design and experimental evaluation of a MEMS-based semicircular canal prosthesis. 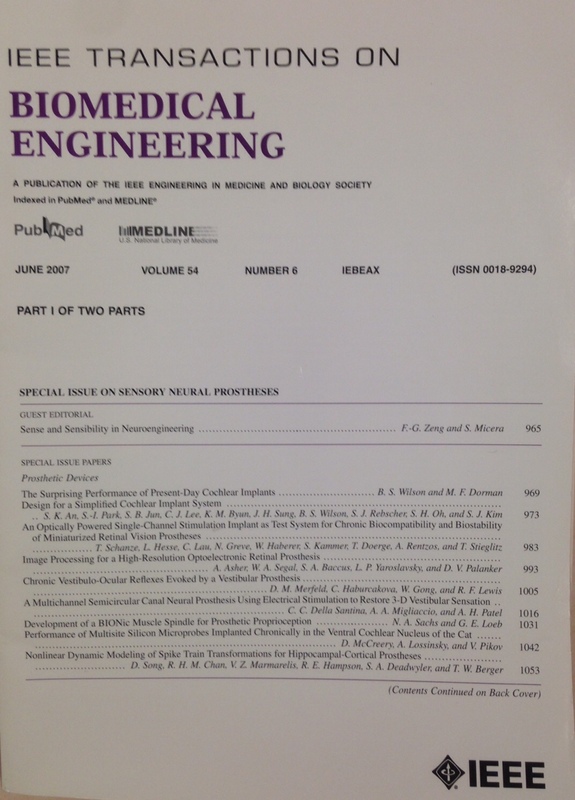 Neural Engineering, 2003. Conference Proceedings. First International IEEE EMBS Conference on, IEEE. Zeng, F.-G., S. Oba and A. Starr (2001). “Supra threshold processing deficits due to desynchronous neural activities in auditory neuropathy.” Physiological and Psychophysical Bases of Auditory Function: 365-372. Zeng, F.-G. (2000). 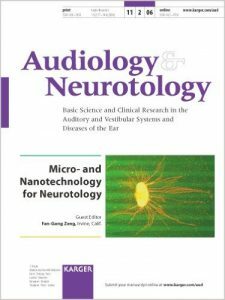 “Auditory neuropathy: why some hearing-impaired listeners can hear but do not understand and how can DSP technology help them.” IEEE Signal Processing Society, Ninth DSP (DSP 2000) Workshop, Hunt, TX. Galvin, J. and F. G. Zeng (1998). “Musical instrument perception in cochlear implant listeners.” Proc of 16th Inter Cong Acoust and 135th Meet Acoust Soc Am 3: 2219-2220. Ay, S. U., B. Shen and F.-G. Zeng (1998). “High performance programmable bi-phasic pulse generator design for a cochlear speech processor.” ISCAS’98 – Proceedings of the 1998 IEEE International Symposium on Circuits and Systems. Zeng, F.-G., M. Zhang, K. G. Mehrotra, C. K. Mohan and S. Ranka (1990). “A neural network approach to prediction of psychological performance in frequency discrimination.” 1990 IJCNN International Joint Conference on Neural Networks, San Diego.